Astilbes are one of those garden plants that are just so easy to love. Originating in Asia, there are now a number of hybrids available worldwide, providing gardeners with a wide range of choice in size, color, and growth characteristics. There are so many different species and presentations -- from short to tall, rigid to droopy, and even wispy to bushy. Their striking good looks complement just about any garden, especially when planted with variegated hostas, grasses, and a variety of ferns. Astilbes in general are gorgeous when they are in flower and the blossom can last for quite some time. Once done flowering, their seed heads also can last a long time, adding texture and visual interest to many gardens with their vertical, bottle-brush, feathery shape. Colors range from white to pink to reds. 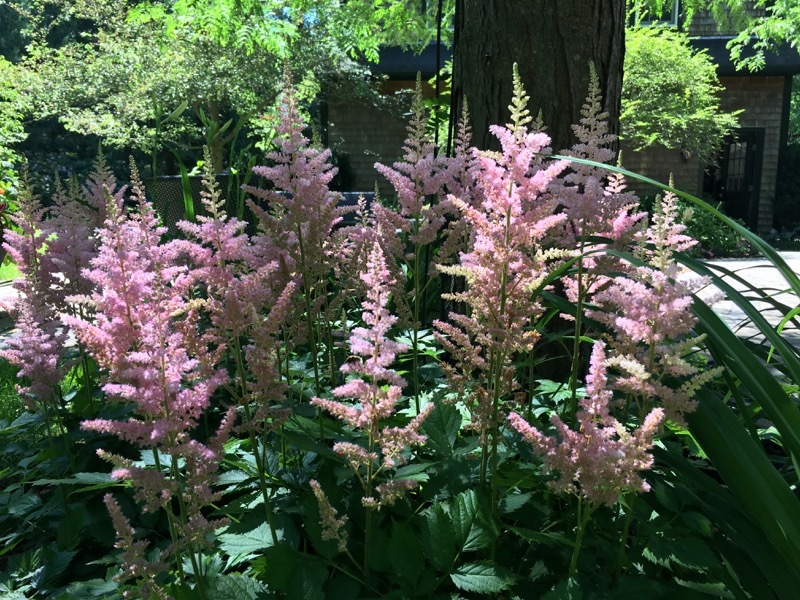 Astilbes do well in shade to partial sun but they need moisture, so the more sun you offer, the more important it is to have a moist soil profile that enables them to handle it.